SHOP TILL YOU DROP: Customers inside Wasteland in San Francisco’s Haight and Ashbury district sift through the many racks of both new and secondhand merchandise in search of seasonal and vintage pieces to complete their ever-expanding closets. Shopping for new clothes can be daunting, especially when you only have $20 to your name and everything at Urban Outfitters is at least twice that. But worry not, there’s another, cheaper way to look like a hipster without spending $50 on a white v-neck. Welcome to the wonderful world of thrifting, where 20 bucks will get you far, kid, and where you don’t have to starve yourself in order to buy that really cool faux-vintage concert tee from the 1970’s, but can get the real one for $5 instead. The famous Haight and Ashbury in San Francisco is likely one of the best areas to get your thrift on. With a wide range of stores from classic 1950s vintage to punk leftovers from the 70s, you’re guaranteed to find something unique. POPPIN’ TAGS: Crossroads Trading Co. in the Haight and Ashbury district of San Francisco offers a wide variety of clothes for every hipster in need. Crossroads is the place to find the best deals on clothes. Prices generally start at around $10 depending on the item of clothing. There is a large selection of jeans for all sizes and genders, as well as a wide variety of shirts, dresses and shoes. The downside with Crossroads is that many of the items tend to be out of style or last season so you have to search for what you want, but you might not always find it. 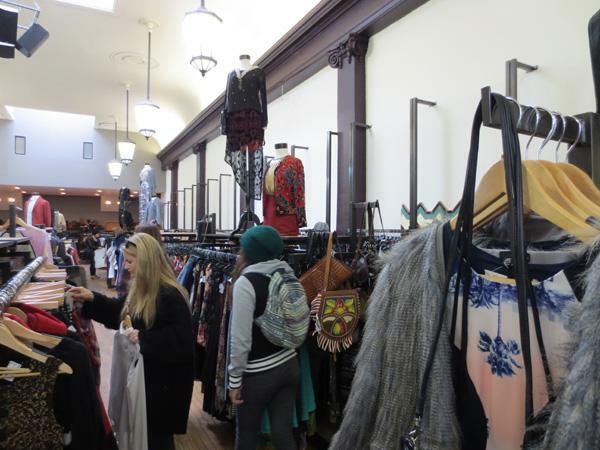 BUY, SELL, TRADE: Buffalo Exchange in San Francisco sells both new and used clothes at low prices. My personal favorite shopping destination, Buffalo Exchange, also located in the Haight and Ashbury district of San Francisco, has one of the better selections of used clothes. The dress selection is especially notable and ranges from classic vintage (i.e. 1940s to the 1960s) to the more modern. Although it’s a tad more expensive (the average shirt prices at around $15), it is well worth it. If you’re looking for a greater reward for your time, this is the place to go. THRIFTING IN THE WILDS: The unique atmosphere of Haight and Ashbury translates into the distinct shopping experience that can only be found in the district. The most expensive of the three, Wasteland offers an extremely varied array of clothing choices for men and women. By doing some thorough digging, you’ll be able to find the grandma sweater you wanted for around $10, but you’ll be sifting through $200 t-shirts to find it. While shopping, be aware of the prices, and try not to try on something expensive if you can’t afford it. Shopping at thrift stores can be easy, but selling your clothes is a different story. Here are some tips to make sure you get the most out of your closet leftovers. Every once in a while, go through your dresser and find the items that you don’t wear anymore, or never wore for that matter. Look for brands that are recognizable and that people will want to have. If any of what you plan to sell is damaged or has holes in it, throw it in a donation pile for Goodwill. If there’s a small stain on it that you can cover up with a strategically placed button, then go for it. Try to find some clothes that are either still “in” or are timeless (like a little black dress or slim-fitting jeans). Be aware of the current fashion seasons — don’t sell summer clothes during the winter season and vice versa. A Million Bucks: Is Prom Worth It?